In my humble opinion, nothing really beats a female singer/songwriter with some beautiful stories to tell. Of course “beautiful” is all relevant. In so many ways, the greatest bouts with misery can bring out some of the most beautiful words the English language has to offer. Some of the sweetest love songs are merely a house built on a plot of land called pain. So even when anger fills the heart, there is always a much kinder way to put your heart out on that metaphorical line, and release whatever demons that reside within yourself. 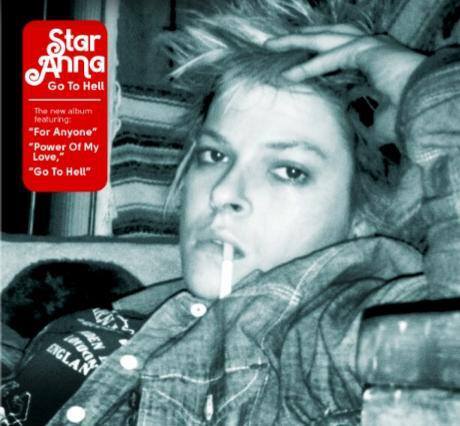 And no greater example of such a thing can be found than in the immaculate album Go To Hell from Seattle’s latest gem of a musician known as Star Anna. With a voice that simply uplifts your spirit even as she tried to bring you down, Star Anna creates a delightful conjuring of what it once felt like to hear a of angel with the attitude of the devil herself. Go To Hell has the feel of a closet being opened, and the skeletons scatter around your dirty Chuck Taylor’s. It is a little bit country, a little bit punk, obviously Americana inspired, and all around delight. Whether you enjoy soft-hearted love ballads like “Mean Kind of Love”, bitter keyboard filled hate speech like “For Anyone”, or the sweetest Tom Waits cover ever imaginable like “Come On Up To The House”, this is an album that is going to make yearn to love and live all over again. Of course, a personal favorite of mine has to be “Everything You Know”, which is a perfectly orchestrated bit of mellow dramatic rage! Anna sings with such delicacy yet with so much damn empowerment that she is an absolute thrill to listen to. There isn’t a single disappointing aspect of this amazing album. It’s just all there for your taking. Go To Hell will be released on September 24th on Spark & Shine Records. Head on over HERE to learn how you can pre-order the album TODAY!